The man with the moustache greets me in front of the hotel with his smile as broad as his arms wide open. ‘Welcome to Aqaba. Welcome, welcome’ – pronouncing ‘c’ like how the Spanish would pronounce a ‘c’, like all Arabs do here. He takes my luggage from the taxi and leads me into the hotel. It’s 2 am and all the lights are out in the building apart from the reception area. We are careful not to make a loud noise, but our whispers still echo against the stone walls, slicing the the cool early morning air. ‘Oh.. so beautiful, so beautiful’. He keeps repeating as he helps me check in and carries my luggage upstairs, smile never leaving his face. He opens the door for me and places the luggage on the floor. 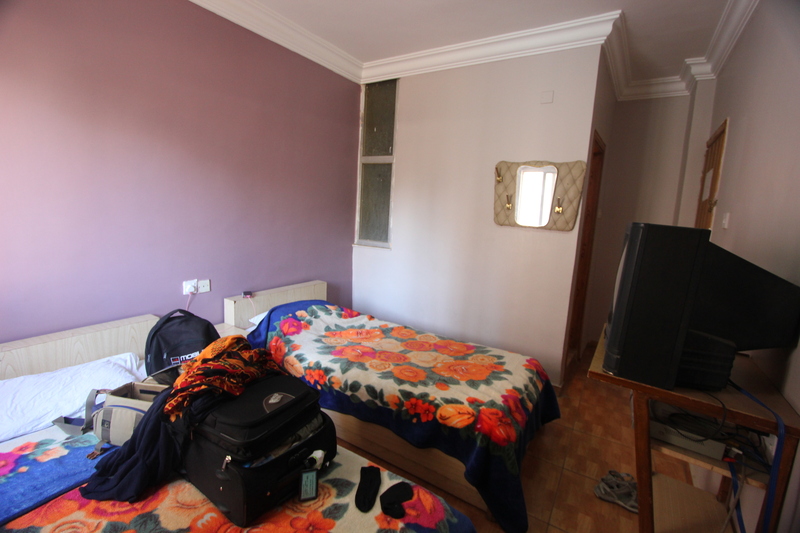 It is a small plain room, with thick furry colourful blankets being the most decorated furniture in the place. In the middle of the room is a chunky, old fashioned TV on a stand with it’s legs at an angle that makes it look unstable. It takes up so much room that I need to twist my body sideways whenever I walk past it, so I don’t knock my arm on it’s protruding wooden panel. In the corner of the room is an equally clunky fridge. 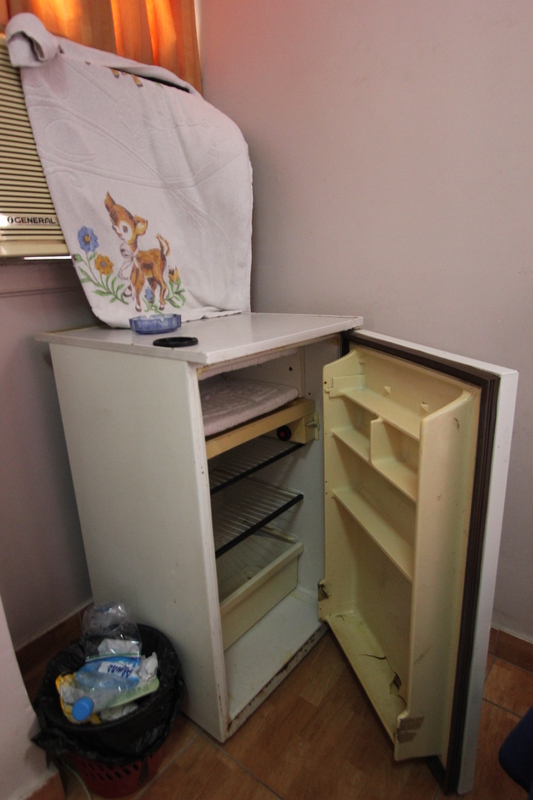 Despite the online advert promising a mini-bar, the fridge is totally empty. The smiling man turns on the light in the bathroom – a clean modern one to my surprise – and shows me the switch that operates the electric shower. Then he goes towards the other end of the room and turns on the air conditioning on for me. It’s been a long long day which includes getting lost in As-Salt and sitting in the bus to Aqaba on an empty stomach for 7 hours. My heart and soul desires nothing else but a hot shower and a bed to collapse onto. But there he stands in the middle of the room, still beaming with a smile. ‘Oh I love you. The moment you got out of the taxi.. I saw you.. So beautiful. I love you’. My mind races at this unprecedented situation. Why is he just standing there? Is he waiting for an invitation? I quickly scan his posture and eyes for any sign of lusty expectation, but to my relief I find none. Just an innocent adoration. ‘Thank you’, I reply courteously and obligingly. Had I ever in my life responded so casually to an I-love-you. As soon as he leaves the room, I rush into shower and savour every moment under hot water. Air condition is a little too cold to have it on during the night, but I cannot figure out how to turn it off completely. The off button I pressed has stopped it from pumping out cool air, but it carries on whirling. Never mind. I drop onto the blue and orange blanket, its thick fur comforting and warm against my freshly washed skin. With the buzzing of the air condition reverberating in the room, I sleep ever so contently.